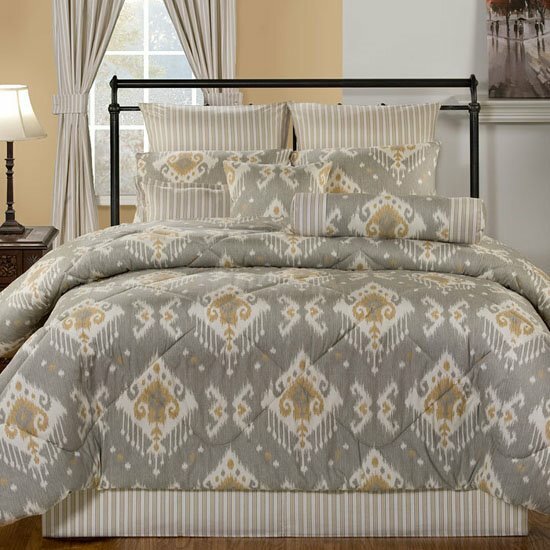 Taos comforter set by Victor Mill | P.C. Fallon Co.
Taos has an appealing southwestern appeal and distinctive beauty, much like the lovely mountainside community in New Mexico which inspired the designers. The main print, created in updated neutral tones of sagebrush gray, ochre, and desert sand, is reminiscent of traditional textiles hand-woven by Native Americans. The same serene tones are used in a complementary striped fabric chosen for the tailored Euro shams and bedskirt. Available in comforter sets, multiple piece sets called Grand Suites, daybed sets, bedspreads, window treatments including drapes and valances, accent pillows, shower curtain and bulk fabric. If you need a bedskirt longer than the standard 15” drop, Victor Mill offers an 18” or 21” bedskirt drop for a small additional Surcharge. Just add the desired Surcharge to your shopping cart when you purchase the other items. The surcharge is the same regardless of size of your bedding. 100% cotton and poly fiber fill in the comforters and spreads. Dry clean recommended. These are made to order items. Allow approximately 2 weeks for shipment. Sewn in the USA. See below for the complete listing of all the Taos by Victor Mill items. Taos Full size 4 piece Comforter Set by Victor Mill. Much like the iconic artists’ colony in the arid mountains of New Mexico which inspired the designers, the Taos bedding ensemble has a truly unique appeal. The main print tips its hat to the traditional textiles handwoven by Native Americans in the American southwest. This appealing graphic design in new neutrals of sagebrush gray, ochre, and desert sand takes the spotlight as the comforter and the standard shams. A complimentary stripe in the same serenely neutral hues is used for the tailored bedskirt and Euro shams. Full size 4 piece comforter set includes a full size comforter 86” X 96”, full 15” drop bedskirt and two standard shams. 100% cotton face and poly fiber fill. Dry clean recommended. This is a made to order item. Allow approximately 2 weeks for shipment. Sewn in the USA. Taos Queen size 4 piece Comforter Set by Victor Mill. Much like the iconic artists’ colony in the arid mountains of New Mexico which inspired the designers, the Taos bedding ensemble has a truly unique appeal. The main print tips its hat to the traditional textiles handwoven by Native Americans in the American southwest. This appealing graphic design in new neutrals of sagebrush gray, ochre, and desert sand takes the spotlight as the comforter and the standard shams. A complimentary stripe in the same serenely neutral hues is used for the tailored bedskirt and Euro shams. Queen size 4 piece comforter set includes a queen size comforter 92” X 96”, queen 15” drop bedskirt and two standard shams. 100% cotton face and poly fiber fill. Dry clean recommended. This is a made to order item. Allow approximately 2 weeks for shipment. Sewn in the USA. Taos Twin size 3 piece Comforter Set by Victor Mill. Much like the iconic artists’ colony in the arid mountains of New Mexico which inspired the designers, the Taos bedding ensemble has a truly unique appeal. The main print tips its hat to the traditional textiles handwoven by Native Americans in the American southwest. This appealing graphic design in new neutrals of sagebrush gray, ochre, and desert sand takes the spotlight as the comforter and the standard shams. A complimentary stripe in the same serenely neutral hues is used for the tailored bedskirt and Euro shams. Twin size 3 piece comforter set includes a twin comforter 72” X 96”, twin 15” drop bedskirt and one standard sham. 100% cotton face and poly fiber fill. Dry clean recommended. This is a made to order item. Allow approximately 2 weeks for shipment. Sewn in the USA. Taos California King size 4 piece Comforter Set by Victor Mill. Much like the iconic artists’ colony in the arid mountains of New Mexico which inspired the designers, the Taos bedding ensemble has a truly unique appeal. The main print tips its hat to the traditional textiles handwoven by Native Americans in the American southwest. This appealing graphic design in new neutrals of sagebrush gray, ochre, and desert sand takes the spotlight as the comforter and the standard shams. A complimentary stripe in the same serenely neutral hues is used for the tailored bedskirt and Euro shams. California King size 4 piece comforter set includes a king size comforter 110” X 96”, Cal king 15” drop bedskirt and two king shams. 100% cotton face and poly fiber fill. Dry clean recommended. This is a made to order item. Allow approximately 2 weeks for shipment. Sewn in the USA. Taos King size 4 piece Comforter Set by Victor Mill. Much like the iconic artists’ colony in the arid mountains of New Mexico which inspired the designers, the Taos bedding ensemble has a truly unique appeal. The main print tips its hat to the traditional textiles handwoven by Native Americans in the American southwest. This appealing graphic design in new neutrals of sagebrush gray, ochre, and desert sand takes the spotlight as the comforter and the standard shams. A complimentary stripe in the same serenely neutral hues is used for the tailored bedskirt and Euro shams. King size 4 piece comforter set includes a king size comforter 110” X 96”, king 15” drop bedskirt and two king shams. 100% cotton face and poly fiber fill. Dry clean recommended. This is a made to order item. Allow approximately 2 weeks for shipment. Sewn in the USA. Taos Twin size 7 piece Comforter Set by Victor Mill. Much like the iconic artists’ colony in the arid mountains of New Mexico which inspired the designers, the Taos bedding ensemble has a truly unique appeal. The main print tips its hat to the traditional textiles handwoven by Native Americans in the American southwest. This appealing graphic design in new neutrals of sagebrush gray, ochre, and desert sand takes the spotlight as the comforter and the standard shams. A complimentary stripe in the same serenely neutral hues is used for the tailored bedskirt and Euro shams. Twin size 7 piece comforter set includes a twin comforter 72” X 96”, twin 15” drop bedskirt, one standard sham, one euro sham and three decorative pillows. 100% cotton face and poly fiber fill. Dry clean recommended. This is a made to order item. Allow approximately 2 weeks for shipment. Sewn in the USA. Taos Full size 9 piece Comforter Set by Victor Mill. Much like the iconic artists’ colony in the arid mountains of New Mexico which inspired the designers, the Taos bedding ensemble has a truly unique appeal. The main print tips its hat to the traditional textiles handwoven by Native Americans in the American southwest. This appealing graphic design in new neutrals of sagebrush gray, ochre, and desert sand takes the spotlight as the comforter and the standard shams. A complimentary stripe in the same serenely neutral hues is used for the tailored bedskirt and Euro shams. Full size 9 piece comforter set includes a full size comforter 86” X 96”, full 15” drop bedskirt, two standard shams, two euro shams and three decorative pillows. 100% cotton face and poly fiber fill. Dry clean recommended. This is a made to order item. Allow approximately 2 weeks for shipment. Sewn in the USA. Taos Queen size 9 piece Comforter Set by Victor Mill. Much like the iconic artists’ colony in the arid mountains of New Mexico which inspired the designers, the Taos bedding ensemble has a truly unique appeal. The main print tips its hat to the traditional textiles handwoven by Native Americans in the American southwest. This appealing graphic design in new neutrals of sagebrush gray, ochre, and desert sand takes the spotlight as the comforter and the standard shams. A complimentary stripe in the same serenely neutral hues is used for the tailored bedskirt and Euro shams. Queen size 9 piece comforter set includes a queen size comforter 92” X 96”, queen 15” drop bedskirt, two standard shams, two euro shams and three decorative pillows. 100% cotton face and poly fiber fill. Dry clean recommended. This is a made to order item. Allow approximately 2 weeks for shipment. Sewn in the USA. Taos California King size 10 piece Comforter Set by Victor Mill. Much like the iconic artists’ colony in the arid mountains of New Mexico which inspired the designers, the Taos bedding ensemble has a truly unique appeal. The main print tips its hat to the traditional textiles handwoven by Native Americans in the American southwest. This appealing graphic design in new neutrals of sagebrush gray, ochre, and desert sand takes the spotlight as the comforter and the standard shams. A complimentary stripe in the same serenely neutral hues is used for the tailored bedskirt and Euro shams. California King size 10 piece comforter set includes a king size comforter 110” X 96”, Cal king 15” drop bedskirt, two king shams, three euro shams and three decorative pillows. 100% cotton face and poly fiber fill. Dry clean recommended. This is a made to order item. Allow approximately 2 weeks for shipment. Sewn in the USA. Taos King size 10 piece Comforter Set by Victor Mill. Much like the iconic artists’ colony in the arid mountains of New Mexico which inspired the designers, the Taos bedding ensemble has a truly unique appeal. The main print tips its hat to the traditional textiles handwoven by Native Americans in the American southwest. This appealing graphic design in new neutrals of sagebrush gray, ochre, and desert sand takes the spotlight as the comforter and the standard shams. A complimentary stripe in the same serenely neutral hues is used for the tailored bedskirt and Euro shams. King size 10 piece comforter set includes a king size comforter 110” X 96”, king 15” drop bedskirt, two king shams, three euro shams and three decorative pillows. 100% cotton face and poly fiber fill. Dry clean recommended. This is a made to order item. Allow approximately 2 weeks for shipment. Sewn in the USA. Taos 4 piece Daybed Set by Victor Mill. Much like the iconic artists’ colony in the arid mountains of New Mexico which inspired the designers, the Taos bedding ensemble has a truly unique appeal. The main print tips its hat to the traditional textiles handwoven by Native Americans in the American southwest. This appealing graphic design in new neutrals of sagebrush gray, ochre, and desert sand takes the spotlight as the Daybed and the standard shams. A complimentary stripe in the same serenely neutral hues is used for the tailored bedskirt and Euro shams. 4 piece Daybed set includes a 64" x 100" daybed comforter, 15" drop daybed bedskirt and 2 king shams. 100% cotton face and poly fiber fill. Dry clean recommended. This is a made to order item. Allow approximately 2 weeks for shipment. Sewn in the USA. Taos Standard size Sham by Victor Mill. Much like the iconic artists’ colony in the arid mountains of New Mexico which inspired the designers, the Taos bedding ensemble has a truly unique appeal. The main print tips its hat to the traditional textiles handwoven by Native Americans in the American southwest. This appealing graphic design in new neutrals of sagebrush gray, ochre, and desert sand takes the spotlight. Measures 20" X 26" 100% cotton. Dry clean recommended. This is a made to order item. Allow approximately 2 weeks for shipment. Sewn in the USA. Taos King size Sham by Victor Mill. Much like the iconic artists’ colony in the arid mountains of New Mexico which inspired the designers, the Taos bedding ensemble has a truly unique appeal. The main print tips its hat to the traditional textiles handwoven by Native Americans in the American southwest. This appealing graphic design in new neutrals of sagebrush gray, ochre, and desert sand takes the spotlight. Measures 20" X 36" 100% cotton. Dry clean recommended. This is a made to order item. Allow approximately 2 weeks for shipment. Sewn in the USA. Taos striped Euro sham by Victor Mill. A complimentary stripe in the serenely neutral hues. A lovely accent for your Taos comforter. Use one for a twin bed, two for full and queen size beds and three for a king size bed. Designed to go behind the standard and king size shams. Tailored 26" X 26" 100% cotton. Dry clean recommended. This is a made to order item. Allow approximately 2 weeks for shipment. Sewn in the USA. Taos Neckroll by Victor Mill. Coordinates with the Taos bedding ensemble. Measures 7" X 20" 100% cotton. Dry clean recommended. This is a made to order item. Allow approximately 2 weeks for shipment. Sewn in the USA. Taos Square Accent Pillow by Victor Mill. Coordinates with the Taos bedding ensemble. Measures 18" X 18" 100% cotton. Dry clean recommended. This is a made to order item. Allow approximately 2 weeks for shipment. Sewn in the USA. Taos Rectangular Accent Pillow by Victor Mill. Coordinates with the Taos bedding ensemble. Measures 12" X 16" 100% cotton. Dry clean recommended. This is a made to order item. Allow approximately 2 weeks for shipment. Sewn in the USA. Taos Shaped Valance by Victor Mill. Coordinates with the Taos bedding ensemble. Designed to fit a standard window width. Measures 50" x 17", 3 inch rod pocket. 100% cotton. Dry clean recommended. This is a made to order item. Allow approximately 2 weeks for shipment. Sewn in the USA. Taos Tailored straight Valance by Victor Mill. Coordinates with the Taos bedding ensemble. Designed to fit a standard window width. Measures 52" x 17", 3 inch rod pocket. 100% cotton. Dry clean recommended. This is a made to order item. Allow approximately 2 weeks for shipment. Sewn in the USA. Taos Stripe Drapes with Tiebacks by Victor Mill. Goes with the Taos bedding ensemble. Each panel measures 50" X 84". Tiebacks included. Measures 100"W x 84"L, 3 inch rod pocket. 100% cotton. Dry clean recommended. This is a made to order item. Allow approximately 2 weeks for shipment. Sewn in the USA. Taos Shower Curtain by Victor Mill. Button holed top. Measures 72" X 72" 100% cotton. Dry clean recommended. This is a made to order item. Allow approximately 2 weeks for shipment. Sewn in the USA. Taos Fabric (Sold by the yard, non-returnable) by Victor Mill. Measures 54" wide 100% cotton. Dry clean recommended. Ships direct from Victor Mill.